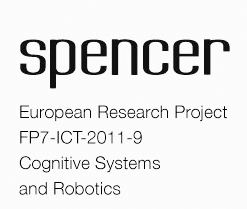 Welcome to SPENCER, a EU-funded research project in the area of robotics. We are a consortium of six University partners and two industrial partners from five European countries. SPENCER will break new ground for cognitive systems in populated environments. Our research covers key areas of interactive intelligent systems such as perception of people and groups of people in sensory data, normative human behavior learning and modeling, socially-aware mapping, and socially-aware task, motion and interaction planning in unstructured real-world environments and from mobile platforms. In a final demonstration scenario we will deploy a fully autonomous mobile robot for smart passengers flow management at the Amsterdam Schiphol Airport.